In today’s time as everything seems to be advertised on the internet, using banners for your advertisement may seem defunct. But it is actually surprising that these traditional marketing tools are still very popular and garner much public attention. The right kind of banners with an attractive design can catch the fancy of many. And while many companies advertise through the internet, they also do so via traditional marketing ways of print media out of which the roll up banner stands are easily the most convenient and easy-to-use. Their popularity is due to the fact that they are reusable and mobile. 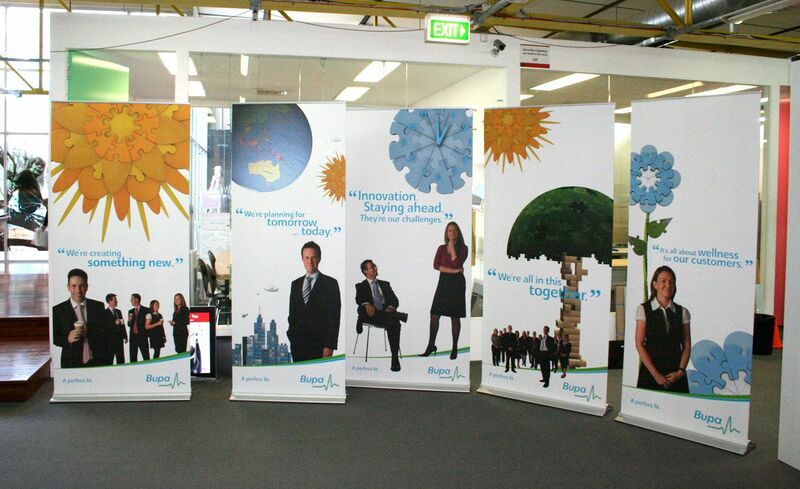 Below is some basic information on roll-up banners and their advantages and disadvantages. One has to have the design, content and graphics intelligently designed if roll-up banner stands are being used for advertising. Since so many different forms of media are used today for advertising, it has to be eye-catchy, with more said in less words. It was revealed by a recent study that out of 10 people who would notice a banner, onle one will read it properly, two will look at the headline and the other two will only notice the picture or pattern. The other five may not notice it at all out of disinterest. Therefore, keeping these points in mind, one should add some attractive picture in the roll up stand. However, one should only use picture that they are trying to promote and not go overboard; there should be just enough to generate curiosity. Some eye-catchy headlines, preferably a humourous one would do great to attract consumers. If you can make them laugh, you can make them remember your product. Think as a consumer, what would attract you to buy a product and write what they would like to know, focussing on the positive points and benefits. Today, one can experiemnt a lot with what can be printed on roll-up banner stands due to the advancement in technology. Be it photographic imageso on plastic sheets or embossing, there is no limit to what one can present. Print quality has also improved a lot and will not fade with time. Also, one can chose a suitable size from a variety of sizes. The best thing about roll-up banner stands is the flexibility in their usage. When not in use, they can just be rolled-up and kept aside. Since they are light weight and easy-to carry, they can be transported anywhere. They can be set up on flat surfaces or just hung as needed and can be reused for multiple events. One can remove the existig banner, put the new one on the banner stand. The stands come in many shapes, sizes and materials. Aluminium casing ones are the most commonly used.. Another kind is the aluminium support structure with black plastic ends- a simple and elegant design. Plastic banners in different colours are also available these days. Popupbanners.ca provide a variety of roll-up banners and stands and deliver to naywhere in Canada whithin one day!